Biomphalaria snails are instrumental in transmission of the human blood fluke Schistosoma mansoni. With the World Health Organization's goal to eliminate schistosomiasis as a global health problem by 2025, there is now renewed emphasis on snail control. Here, we characterize the genome of Biomphalaria glabrata, a lophotrochozoan protostome, and provide timely and important information on snail biology. We describe aspects of phero-perception, stress responses, immune function and regulation of gene expression that support the persistence of B. glabrata in the field and may define this species as a suitable snail host for S. mansoni. 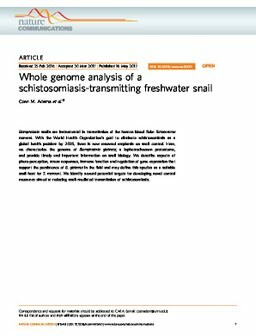 We identify several potential targets for developing novel control measures aimed at reducing snail-mediated transmission of schistosomiasis.